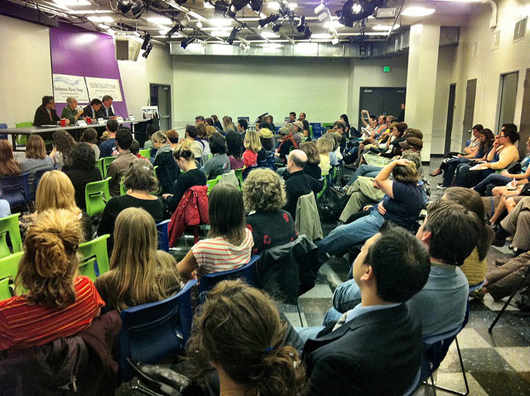 On Monday the San Francisco Urban Agriculture Alliance (SFUAA) co-hosted a forum for the San Francisco Mayoral Candidates on the topic of 'Our Food, Our Schoolyards, Our Water'. Four candidates attended, and answered questions from a crowd of about one hundred advocates for urban agriculture,water conservation and the environment. Many interesting ideas were floated, both by the crowd and by candidates, on the topics, and after the formal event lively discussions ensued on the floor. I've summarized some of the ideas that stood out for me below, and you can find the candidates' answers to the SFUAA survey here. 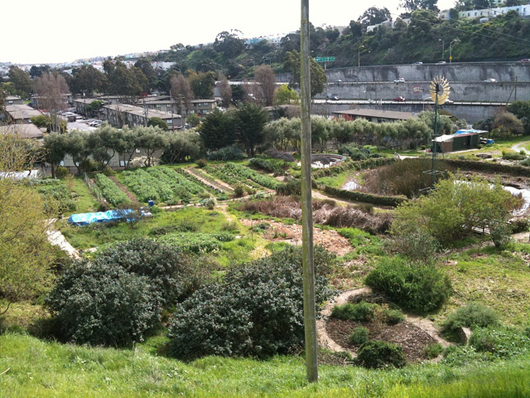 The overwhelming theme to the questions about urban ag was access to land, and to equipment. One question suggested the formation of Urban Ag Resource Centers within neighborhoods, where residents could borrow tools, get access to compost from the curbside composting program, and presumably swap tips as well. Another question challenged the candidates to create twelve new community gardens by the end of 2012. Candidates were queried on their support of the Green Schoolyard Alliance, and edible school gardens. Audience members suggested incentives for roof-top gardens to increase access to gardening, use of underused public and private lands (including Rec and Park Lands), and challenged to candidates to support The Free Farm, which not only provides a source of nutritious food to the community but also builds a social support network among volunteers and customers. Several questions also related to water conservation, and alternative sources of water for gardening, including supporting grey water systems. Candidate Chiu made reference to an issue common to all urban landscapes - availability of construction funds, but no operations fund, which means it's easy to build but then an ongoing challenge to maintain the landscapes. Candidate Baum suggested that rooftop gardens might be incentivized by assessing the amount of storm water diverted from S.F. 's combined storm/sewer system, and refunding the amount of water not treated because of the garden. Candidates also suggested that (if elected) they would survey open lands to identify suitable plots for urban ag, or form Urban Ag Departments to work with district supervisors. One thing that was not always clear was what audience members meant by urban ag/farming, as it seemed to be used interchangeably for both community gardens (land subdivided for use by multiple individual gardeners) and for larger, more singular farms like Hayes Valley Farm or Alemany Farm. This is an important distinction in planning for urban ag systems. Community gardens can be located on small, or odd-shaped parcels, since the land is further subdivided and individual gardeners can tolerate more unusual conditions - like the 3:1 slope at the back of my own plot in Argonne Garden. For small farms, with farmers making a living off the land, there are some basic principles of efficiency that would come into play when choosing suitable land, including size, dimensions, access to full sun during the day and slope. It's my feeling that both types of growing are essential to a holistic urban ag plan. Congratulations to the SFUAA and their partners for organizing the event - great civic participation and lots of food for thought!